Seeing Chip! AKA – The Best Day Ever! Today is 7+5. We are officially one day further than we ever got with Squishy and we have a scan booked today. I can’t begin to describe the nerves that came with this. The feeling that everything could just be brought to and end at this point. I said on Baby and Bump this morning that today was the day things could either get really awesome or really, REALLY crap. I had booked the first available appointment a few weeks ago at our local Baby Bond, so we were up early and ready for the appointment at 0930am. We stopped at Mcdonalds for breakfast and for me to drink as much water as I could fit in my bladder, then we walked up to the Ultrasound Clinic. We soon found it and arrived around twenty minutes early. To my surprise, we were called in straight away. I worried a little, as I had planned to use that fifteen minutes to further fill my bladder, but oh well. I had fretted constantly about whether this scan was going to be internal or external. I was worried that me being a UK size 16-18 would mean they wouldn’t see much of anything at all from the outside, but had been reassured by the website that they can perform an internal ultrasound if needed. We went into the scanning room and I was asked to lay down and shuffle my skirt down so that the sonographer could get to my tummy. There was a big screen in front of us, so Amy and I waited with baited breath to see what would pop up there. One or two? Everything ok? Is there a heartbeat? It took the sonographer probably five seconds at the very most to find our little Chip. Then there was a tense moment when she looked for “cardiac activity”, but we soon saw our baby’s heart beating away nice and steadily. Having never seen that before, both Amy and I (but Amy especially) shed a little tear. It was amazing to see our baby in there. Chip is little more than a blob at the moment, with a crown to rump measurement of 13.1 whole milimetres, but we saw a little wiggle and the heartbeat was nice and strong at 159bpm. Chip was measuring dead on 7+5, so spot on for my dates. 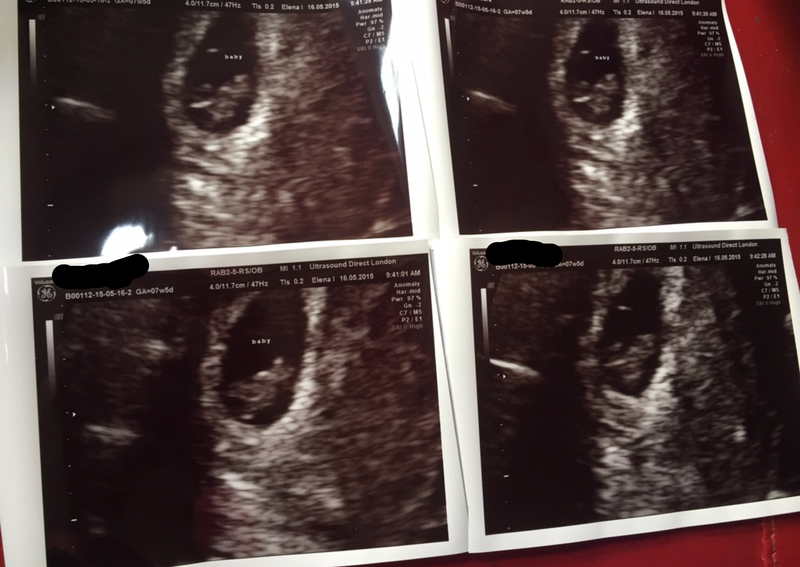 The sonographer pointed the yolk sac out to us, telling us that it really was very tiny now and the placenta would be taking over soon, which does explain my decline in some symptoms. We had a further look at Chip, looking at where teeny arm and hand buds were forming and I just could not get over the image of that teeny tiny heart thumping away. The sonographer also confirmed that Chip was from a left side ovulation – GO LEFTIE! The whole thing probably lasted all of about fifteen minutes, and we were actually out of appointment at 0933 – three minutes after our appointment’s official start time. I will say that although Baby Bond were very efficient, it wasn’t a very personal experience. It was worth every penny to see that our baby was well, but it certainly wasn’t personal. They didn’t even have tissues – Amy had to wipe her eyes with blue roll! Hehe. So, I probably wouldn’t go back to Baby Bond, but to know Chip was well, it was worth every penny. 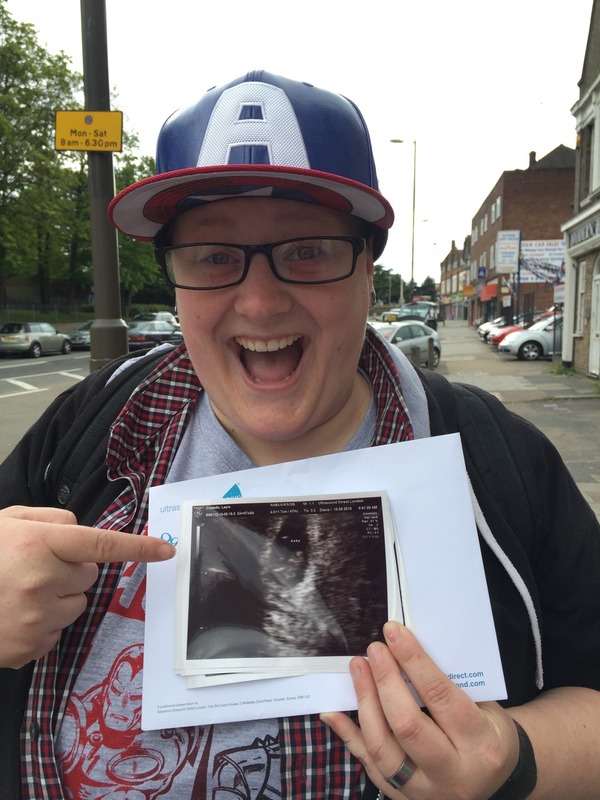 This entry was posted in baby, Chip, Scan, seven weeks and tagged 2015, baby, baby bond, first scan, scanxiety. Bookmark the permalink. 4 Responses to Seeing Chip! AKA – The Best Day Ever! Congratulations again! I’m so glad that Chip is doing well. Apart from the crappy service, I’m so happy for you guys. So so happy. Can’t wait to see chip grow! Look at Amy’s face!! This is so great guys!!! We’re so excited and happy for you!